I really miss baking so much. Not having a kitchen at school really gets to me, but at least I can look back on some of my favorite recipes and try to take advantage of them when I have the time. What really got me inspired this time was some help and encouragement from Jif's SplitJar, a new type of jar of peanut butter that completely eliminates mess. If you know me, you know I get a little bit crazy about not making messes, and one of my hesitations when it comes to baking with peanut butter is how sticky and messy everything gets. But thanks to a free jar sponsored by SplitJar, I don't ever have to worry about that. Their jars are designed to have a lid at each end so you don't have to stick your hand in the end to get it out. I'm also super excited about their new products where we can have both crunchy and creamy in one jar, and a whole other slew of products. My roommate that loves crunchy peanut butter is going to be sooo excited that we don't have to keep buying two different kinds! I baked my Buckeye Brownies with this peanut butter and had way more time to enjoy eating them with my friends because I didn't have to clean up as much. Originally, I had just bought a cheap, normal brownie mix. 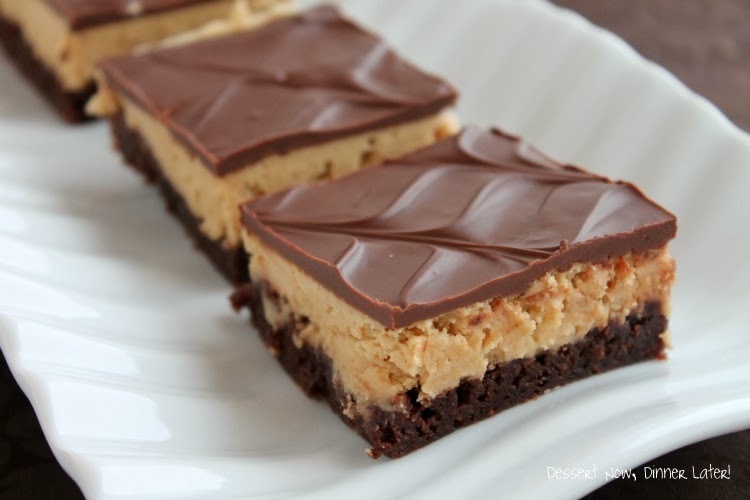 But the peanut butter and chocolate layers are just so rich and moist that it almost would've been better for a brownie mix with chocolate chips or fudge. These brownies are rich, addictive, and so easy to make! I'm so glad I found SplitJar-- be sure to check out their website and buy it at your local grocery store. Their website is interactive and makes buying peanut butter so much more fun.